Saturday, Oct 24, 2015, is GLOBAL ONENESS DAY. Founded by Barbara Marx Hubbard and her Humanity’s Team eight years ago, it is being honored by Iyanla Vanzant, Desmond Tutu, Michael Beckwith, Marianne Williamson, Gray Zukav, Ken Wilber, Jean Houston, Ervin Laszlo, Neale Donald Walsch, Nassim Haramein, Dean Radin, Doreen Virtue, Patricia Cota-Robles, Andrew Harvey, James O’Dea and Matt Kahn, Centers for Spiritual Living and many others. Below is the Global Oneness Declaration. It’s well thought out and worth reading. You are being invited to “own” Oneness, especially on this day, in your own personal way. It’s a wonderful thing to do, and a good and necessary beginning. AND it’s only a beginning. For you mature metaphysicians who make up the bulk of recipients of these mailings, I urge you to go beyond this very important first step by noticing where your thinking differs with Oneness, examining and appropriately changing your thinking if it is not aligned with Oneness–and then extending this change in attitude to a change in your actions. The realization and affirmation of Oneness cannot save our world or change our lives until we make Oneness the basis for our actions. If you accept this invitation, choose one belief/attitude you have that’s not aligned with Oneness and give it some serious thought, make a decision to honor not only the concept but the absolute truth of Oneness, and then start acting from that decision. It’s the only way we can change our world and our Lives. It’s not easy, yet it’s the only way. And it’s worth it! If you decide to begin acting from Oneness rather than how this crazy culture we live in tells us to do Life, I’d love to hear from you about your experiences and your questions! In honor of our mothers on this Mother’s Day weekend, I dedicate this May note to Love—the maternal kind of Love. (I am capitalizing it because it is one of the attributes of God–unconditionally pure, whole and always present to us.) Below this note is a Mothers Day message I gave at OSC in 2011. Love opens our hearts to more in so many ways (more of everything—both joy and pain). Love expands our world — and the whole world! Love expands our health—there is nothing enough love can’t heal! BECAUSE LOVE PUTS US IN THE FLOW OF LIFE! To further realize how valuable acting with Love is, we can take a look at its opposite: withholding love contracts everything in our lives, including the possibilities and potentialities for our lives. It puts a kink in the Flow of Life’s Energy. Yes, there is the risk of experiencing pain when we open ourselves up. But considering the alternative, we don’t really have a choice if we want to have a life that is anywhere near being happy and fulfilled. OPEN YOUR HEART TODAY—A GOOD PLACE TO START IS WITH YOUR MOTHER! Link to Sunday morning, May 2011. During this Mother’s Day talk, I refer to a Rembrandt painting. 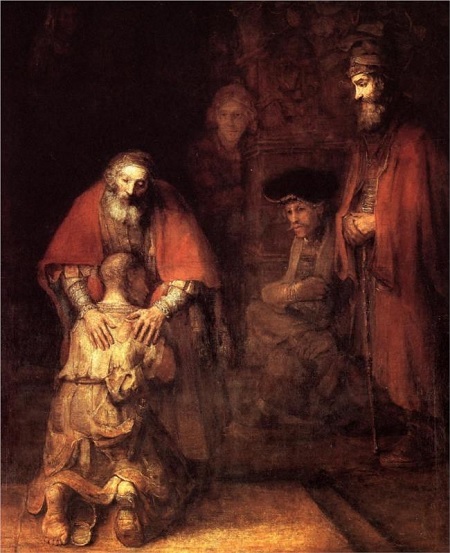 Here’s a link to further information: The Return of the Prodigal Son. In all its strength once more. Yet lo! it has not died. And its eyes to the Easter Morn. What do you really think! Below is a shortened version of what Ernest Holmes, author and founder of the book and spiritual philosophy called The Science of Mind, stated as his beliefs. It is a reduction and summary of 13 original statements Holmes wrote for the Science of Mind Magazine many years ago. 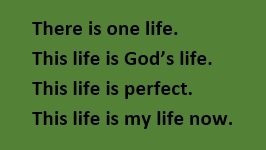 I believe in ONE God expressing through every living being. I believe that God is personal to everyone and makes Itself known to all who recognize Its presence. I believe that God is love and only creates out of a desire to express love. I believe and trust that God has in mind the highest and greatest good for every person and is always seeking to bring that good into their life. I believe that our thought is creative and that how we choose to think creates our personal experience. I believe that by changing the way we think, we can affect our lives in a healing and positive way. I believe in the unity of all life and the immortality of the individual soul forever unfolding. I believe in the eternal goodness, the eternal Loving-Kindness, and the Givingness of life to all. I, Nancy, believe this list covers the basic truths about Life, and that it has the potential to uncover any conflicts in thinking about what Life is that may be keeping one from living her/his ideal life. Questions or comments? I’m available by email or phone. I will also be happy to furnish Holmes’ original, complete statement to anyone who wants it. How can one best celebrate Life with Love? Let’s change one word: We celebrate Life AS Love. We BE Love. Again, the how question arises: “how do we do that?” We can celebrate the easy answer to that question, because we don’t need to find or create or become love; we already are Love. Troward’s list points out that Love is a natural element of who we are, for each of us is made in the image and likeness and out of the substance of God. All that is necessary to express Love’s powerful and healing energy is to remove from our thinking anything that disagrees with it. As we replace our thoughts of judgment, lack and its accompanying jealousy and competition, anger and resentment, we will find ourselves naturally floating in the Allness of God’s Goodness; the seven qualities will be showing up in our individuated, personal lives! When we live AS love and compassion, we live in peace—and in vital, personal fullness! When we turn our attention to the Truth this prayer presents, we withdraw energy from those human truths that generate fear and distrust, giving us a perspective in which we are better able to resolve them. Just as we can’t look in opposite directions at the same time, neither can we think opposing thoughts at the same time. The energy we invest in our choice of a recipient of our attention is a powerful force in this one life we share. Let’s together choose the Higher Truth that lets love reign! ‘Tis the wonderful season in which we relax our day-to-day focus on production to celebrate our relationships–to remember our friends and family and the value they have added to our lives. The very purpose behind the giving of gifts is to honor these connections; without the intention of this recognition, an exchange of gifts becomes frivolous and meaningless! And without a desire to honor our connection with each other, holiday social activities can exhaust us rather than foster a renewal of our spirits. Holidays –holy days or “whole-y” days–are days set aside to recognize our Whole Selves. They provide time and space in which to remember that we are beings of Spirit as well as physical beings with our physical needs. They are days for honoring our spirits and sustaining our Inner Selves with our dearest nourishment: connectedness and love. What better symbol to remember our love and to facilitate the opening of our hearts than that of a newborn child, with its pure love and that love’s powerful potential to displace human fears and attitudes of competition in our world. Whether it’s the Christian Baby Jesus or any newborn child, its promise is the hope that love will reign. I wish to take this opportunity in this season of love and new beginnings to say to you, one and all, that I love you—all of you–my friends and my family (known and unknown, for we are all one) and including those who have taken actions that have hurt me. Everyone that has been a part of my life has influenced a part of me, and has brought me to this blessed moment of complete freedom to love and to BE love. My Christmas wish is that this season and new year be one of greater freedom for you and all humankind. I am excited and hopeful for us as we experience the current protests–through non-violent participation (yeah!) or just through concerned and connected observation. 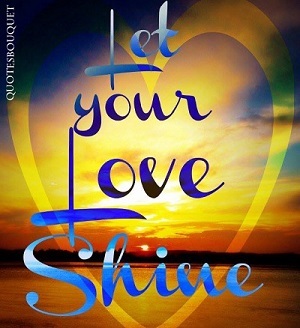 I pray that our voices raised in distress over an absence of reverent love for each other may awaken in us a shift into a deeper consciousness of honoring our oneness. Naming the thing we desire to change is necessary in order to bring our aware consciousness to a focus on its opposite; so yes, let us raise our voices in protest—and then, let us move into a wholehearted and whole-self honoring of the Higher Truth of our Connectedness! We each can embody connectedness and love through whatever honest expression our personal hearts dictate, each contributing our unique selves to Life’s wholeness. This is, after all, the gift each of us has to give. May you find LOVE & CONNECTEDNESS this holiday season. May you experience the joy of BEING it! Happy New Year, Happy Hanukkah, Happy Kwanzaa and Merry Christmas to all! We say thank you because it’s good manners; it promotes positive relationships that have value for ourselves and our society. And when our gratitude is genuine, it feels good—it warms and opens our hearts. There’s more value: Did you know that the attitude of gratitude is a powerful energy — one you can use in your life? Our attention—and our feelings regarding the object of our attention—create a powerful force field that draws to us people / things / experiences that have similar energy fields. Everything in Life has an energy field: people, plants, rocks—even relationships. Check this out for yourself regarding relationships by shifting your opinion of someone, and notice how your feelings change! Appreciation means increase – ask any banker! When we are being thankful- grateful-appreciative, our hearts and our minds and our very lives open up to letting more of life in. Gratefulness makes us high-level receivers! What a wonderful world this would be if each of us lived this way most of the time! I know, we feel we have to close ourselves off sometimes. This world is not always safe, and so for protection, we place armor between ourselves and the world at large. There is risk; many things are in play in our lives, and we don’t know them all. Nor do we know for sure what the response to any of our actions will be. Yet consider the benefits of being open. Life is constantly seeking expansion; it can be expanding your life, if you let it. An open appreciation for the object of your focus sets up an energetic draw of more of that good to you. Are the likely benefits worth the risk of letting in pain? The maxim it’s better to have loved and lost than never to have loved at all is about this risk–a risk inherent in living in this world. Appreciating what’s here rather than focusing on the possibility of pain doesn’t guarantee happiness; it does strongly improve the odds of our lives expanding and prospering. To use this powerful force for greater good, make your thinking a conscious attitude of gratitude that is based in awareness and knowledge. To use this powerful force for greater good, make your thinking a conscious attitude of gratitude that is based in awareness and knowledge. Is it “selfish” to use this energy for ourselves? In our current culture, “being selfish” has a negative connotation. Yet the word is broader than being egocentric. Consider that each of us is responsible for this body and persona we have as a vehicle in this world. It is our job to take care of ourselves, necessarily our first priority before giving to others. It doesn’t work to put others first anyway, because we can only give to others from our own level of wholeness. From wholeness, we have something of value to contribute. This magnetic force can’t be used up, diminished, or taken from anyone else. It’s everywhere present and it’s there for us to use! We’re all putting it into play every day already, every time we focus on something. Applying it with conscious choice and awareness can only be good! Improving our own lives also automatically improves the One Life that we are all a part of–because our lives are a part of It! Every little bit counts—including us! We want “the best” for our children and our loved ones. Often we write or see this phrase written as a closing salutation in letters or emails. We want the best for ourselves, too. Of course we do! We are expansive creatures, meant to be growing and experiencing more! How do we get the best? 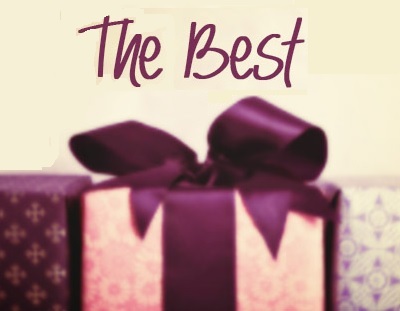 Obviously, we need to be willing to receive the best. We need an attitude of really knowing we deserve and should have more. And we need to know it’s safe— that having more really serves us. It’s surprising how many times when working with a client on this subject of greater prosperity we have uncovered an underlying belief that the person will be rejected by family if s/he becomes successful or more prosperous than they. Another unwillingness to receive greater good is a fear about not knowing how to act or handle money and other assets. The most unusual unwillingness regarding being successful that I’ve come across is that of a client not wanting to furnish his parents with any possible evidence that they might have done a good job raising him! We can trip ourselves up in some pretty tricky ways! Here’s one from my own experience: James Allen, author of the much-loved little book, “As a Man Thinketh,” said that we are made small by our controlling desires and made great by our dominant aspirations. When I first read this, I wondered what Allen meant by “controlling desires.” I have come to think that in today’s language it means a need to control something or someone. It’s like our present psychological concept of resistance: we can be resistant to something—or in this context of getting the best, we can be resistant to something NOT happening–to NOT getting the best. In my personal case, I was resistant to my parents’ telling me to stay small/keep small, to act always as if I deserve nothing. The admonition went further than just being told to be careful to not act inflated or self-important; we were to be totally subservient. Dad used to say often, to all of us, “Who do you think you are? We’re nobody!” Ironically, in my search to honor being a worthy human being, my resistance to being told to be small was, as James Allen pointed out, keeping me small—because that’s what resistance does! Life doesn’t happen through control; it happens by expansion. Control clutches and closes off; expansion requires us to be open in order to receive more. So to prepare to receive the best, we must remove “smallness thoughts” by 1) replace limiting beliefs about ourselves and life, and 2) remove resistances and desires to control—because they make us small, unable to receive. Once we have removed blockages, we can move on to focus on receiving. And again, we run into the business of clearing away thoughts and actions — in order to be the best container to receive the best. Like attracts like. Subtracting from our thoughts and actions that which is not aligned and supportive of our greater prosperity causes us to become the best and clearest receiver we can be. We become the best receiver simply by taking one step forward at a time. Take your very best steps forward, one-by-one-by-one. We all do know what the most principled thing to do is in any given moment. Just do it. One Step at a time. TAKE YOUR BEST STEP FORWARD. We can do it–and together, we can create the best world ever! Our culture’s popular perception of KARMA is that our fate is determined by past deeds–often ‘way past, from a previous lifetime–and that we are living with certain consequences because we are being punished (or rewarded) for choices we made in the past. 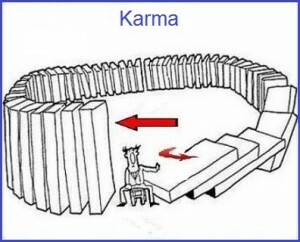 There are some inaccuracies here, for Karma is, quite simply, the Law of Cause & Effect. Yes, we reap the effects we cause. It is true that “what goes around comes around” – but we can change what goes around by changing our action; the law will automatically respond to the new cause, shifting its response to that. KARMA is all about choice. We have the ability to change CAUSE at any time, initiating a changed effect. We have a lot of catchy sayings about the Law of Karma: Like attracts like — We reap what we sow – Be careful what you ask for; you’ll get it! You have the Power of Choice—always! USE IT! Use it wisely! And let peace be with you!